Singing siblings The Proclaimers will be performing at Scunthorpe’s Baths Hall this summer - and tickets are now on sale. Strikingly individual, twin brothers Craig and Charlie Reid have over the years enjoyed huge successes across the globe and in April last year released their tenth album. Following on from the theatre success of the musical drama featuring songs by The Proclaimers, Sunshine On Leith the movie version was a hugely popular release in 2013, spending a month in the top ten generating over £4.8 million at the UK box office, the fifth highest grossing independent release of the year. Expect to hear the classics Sunshine on Leith, (I’m Gonna Be) 500 Miles, Letter From America, I’m on My Way, Life With You, Lets Get Married and more. The Proclaimers perform at Baths Hall on August 5.
n The producers of the perennially popular An Evening of Dirty Dancing: The Tribute Show are bringing their brand new production to The Baths Hall on June 25. Summer Dreaming is a new concert production that pays homage to a bygone era celebrating the iconic music of the 50s and 60s. Musical theatre stalwart Julian Essex-Spurrier continues leads the production having played numerous iconic leading roles including Tony Manero in Saturday Night Fever, Rocky in The Rocky Horror Picture Show, Riff in West Side Story and Rusty in Starlight Express. Relive the good old days with the Summer Dreaming gang as they take you back to a time of jiving, soda shops and high school hops. It’s a highly interactive roller coaster of 50s and 60s fun and frolics. 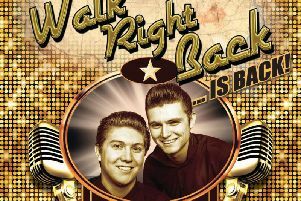 Leave your troubles at the door, find your inner Teddy Boy or Girl, and sing along! Summer Dreaming features the smash hits: Run Around Sue, Fever, Shout, Johnny B Goode, Stand By Me, Whatever Will Be Will Be (Que Sera, Sera), Te-quila, Twist Again, The Locomotion and many more! Tickets are priced £18 each. n How about checking out the songs of Rod Stewart when Paul Metcalfe airs the hits in a concert entitled Some Guys Have All The Luck at Baths Hall on June 4.